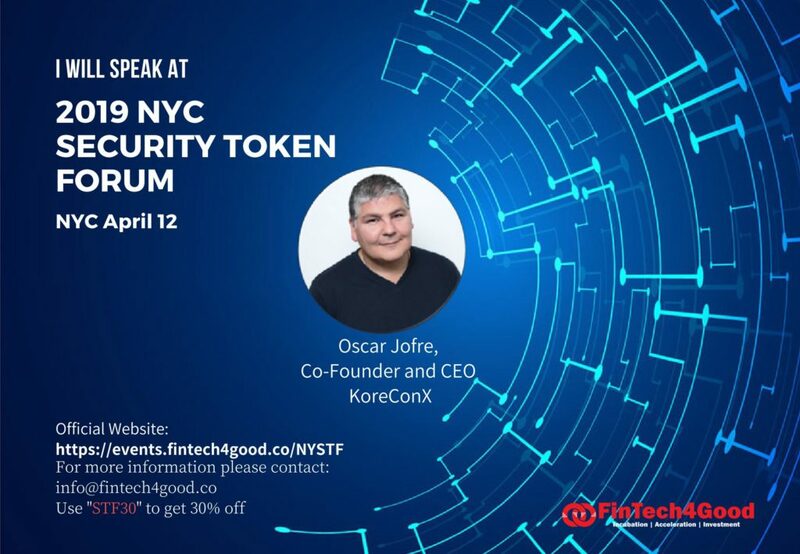 KoreConX’s Co-Founder & CEO, Oscar Jofre, will be speaking at the NYC Security Token Forum on April 12. Digital Security Offering (DSO), or Security Token Offering (STO), has emerged as a new and compliant model to raise fund in 2018. It is estimated that DSOs will grow to $10 trillion in the coming 10 years. However, DSO is still in a very early stage and many traditional investors and companies are not well informed of the benefits and challenges of security tokens. STO Council, initiated by FinTech4Good, brings together issuance platforms, exchanges, advisory firms, law firms, investors and regulators to discuss key issues around key opportunities and risks associated with mainstreaming of Digital Securities. During the Forum, the STO Council will launch the new STO Handbook to provide an introductory guide to the security token ecosystem in the U.S. and to help the readers develop a thorough understanding of Digital Securities. The NYC Security Token Forum will bring key Digital Securities experts together with Wall Street influencers to discuss key issues around Digital Securities and build collaborations for the emergence of a healthy Digital Securities ecosystem. KoreConX’s users can use the code “STF30” to get 30% off. For more information and to buy tickets, visit https://events.fintech4good.co/NYSTF.